Running an MP3 blog, I get people sending me music to review and promote all the time. Some of it is great. A lot of it is OK. And some of it is really bad. Today’s band, EPO-555, is none of those. They’re a step or two above “OK,” but not quite at the “great” level yet. The people in charge of their US marketing sent me their latest album, Mafia, to review and give my opinion of. I never heard of the band before this album, so I can’t offer a very wide perspective, but I’ll give my humble opinions and you all can see what you think on your own by downloading the sample MP3s below. Polls are still open for Group 4, but if you’re done with all that, vote on Group 5 below. Download the MP3s if you need them, but judge the artists, not just the songs above. And let the voting begin! All votes must be received by 7:00 am CST on Wednesday, January 2, 2008. Keep voting on Group 3 until 7:00 am CST Wednesday, December 26, but when you’re done, Group 4 is below for your voting pleasure. If you need them, the official rules are here, but things are pretty simple. Just listen to the MP3s below if you’re unfamiliar with the artists, then vote on who you think is better for each of the one-on-one matches. Vote away, and feel free to leave any comments on your reasoning! All votes must be received by 7:00 am CST on Monday, December 31, 2007. I thought this would make a great Christmas Eve post! Todd Fadel of Agents of Future sent me an e-mail the other day with a compilation he made up with some of the best tracks from 1996’s It Never Snows on Christmas, an album from way back in 1996 of some of the best Portland, Oregon, bands at the time. Why the name It Never Snows on Christmas? Because, says Todd, it never has snowed on Christmas day in Portland, for as long as he can remember. Click here for a zip file of Todd’s best-of compilation, or for the full album, go here. You can listen on-line or to download the songs, just create a free account. Don’t worry – you can still vote on Group 2 until 7:30 am CST Monday, December 24. I just wanted to get things rolling again, so you can also vote on this, Group 3. For a quick rundown of the rules, in case this is your first time around, see here. It’s pretty simple, though. One vote per each one-on-one match. There will be 6 matches between 4 artists. Put your e-mail or WordPress ID in when you vote in the comments, or I’ll be forced to throw your vote out. That’s about it. Now, let’s vote! Back again with another post on Defining Christian Music! Check out my previous posts to get up-to-date, but basically I’ve decided that I don’t like the term “Christian Music.” There are a lot of things that bother me about it, but my main reason for not liking it is that it implies the music is not only by Christians (which I’m fine with) but also exclusively for Christians (which I’m not fine with). So, I don’t like the term as it is, and this post is about what to do about it. I know it’s sort of dumb to be deciding I don’t want to use the term “Christian Music” anymore right in the midst of Christian Music Superbowl I, but, like I said, I don’t like it but I need to figure out what to do about that. Thanks, everyone, for voting on Group 1 last week. Doug Burr was the obvious winner far and above all the competion. Way to go Doug! You are allowed only one vote per one-on-one match. No unfairly voting numerous times for the person you want to win. To vote, leave a comment with who you think should win each of the six face-offs below. Put in a valid e-mail when you leave your comment (or your WordPress ID). I won’t keep your e-mail or anything, but I need to do this in order to keep it a little more kosher. You have 5 days (120 hours) to vote on the bands. So if I put up a match on Friday at 7 am, then I will count the votes on the following Wednesday at 7 am. You have until that time to send in your vote. All votes after that time will not be counted. 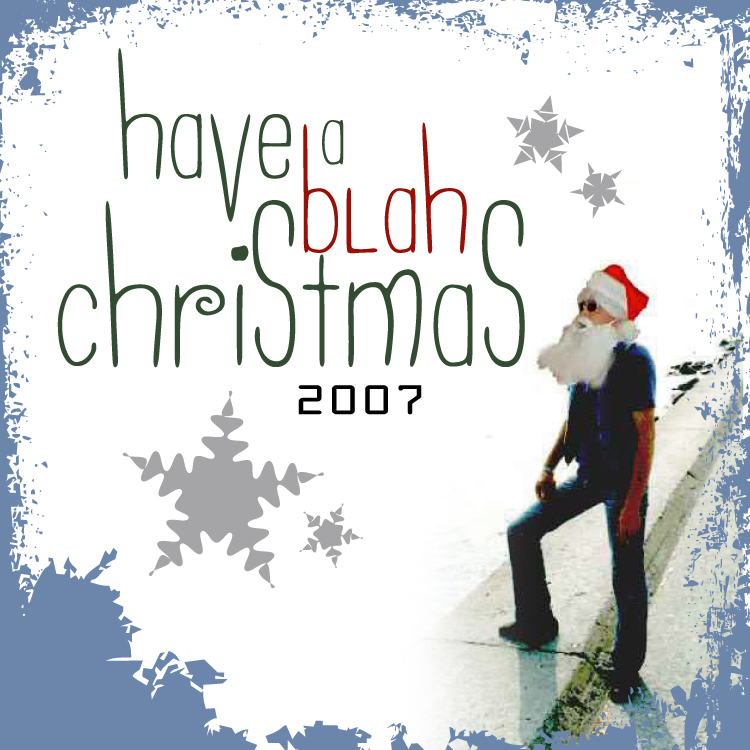 In the spirit of the holiday season, today I offer to you the first ever mix CD at The Blah Blah – Have a Blah Christmas, 2007. I’ve never been a huge fan of Christmas music, but I like it a lot better in December than in October, and I like all the songs in this mix a lot. To download the album art, just right-click on the picture to the left and select “Save Target As.” To download the songs, do the same with the links below. 3. Sufjan Stevens – Come on! Let’s Boogey to the Elf Dance! Hope you like these! Head to the artists’ MySpace for more. The Blah Blah – serving up the best in Christian music MP3s. I apologize for the tiny photo of Steve and Joy Guiles to the left. I’m not positive, but I think that, in real life, they are actually taller. Anyway, I heard about Steve Guiles just recently, and I wanted to pass him along to you guys. 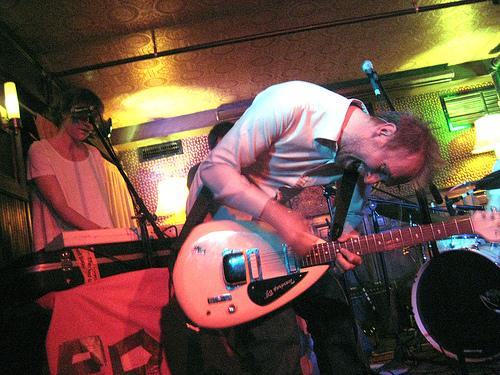 Steve has been recording music for a while now, with various groups and under various names. As Friction Bailey, it’s Steve and his wife Joy pulling off some folky, acoustic pop stuff. As Pushstart Wagon, it’s Steve, Eric Shouse, and Ben Eggehorn doing power pop, college rock kind of songs. As The Vegas Nerve, it’s Steve and a bunch of his college friends. As Steven Wesley Guiles, it’s… uh… Steve.